President Akufo-Addo has visited the Kete Krachi Timber Recovery Limited, a company operating under Government’s 1-District-1-Factory initiative. The company, located in Asuogyaman, in the Eastern Region, runs a timber salvage operation on the Volta Lake, using barge-mounted salvage units, built around modified Caterpillar excavators. It will be recalled that construction of the Volta Lake resulted in vast tracts of hardwood being submerged. These, over the years, have caused repeated fatal accidents on the lake. 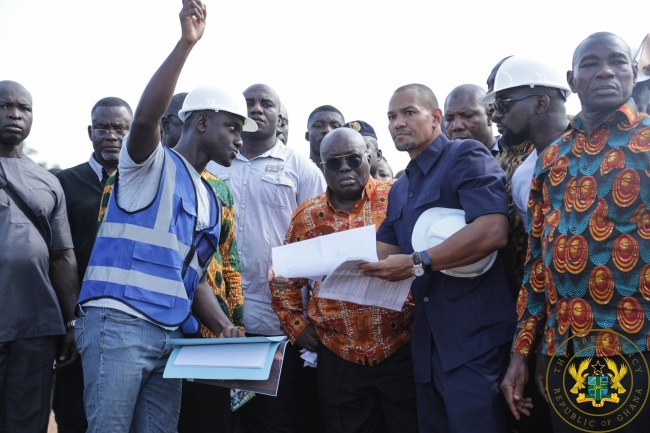 The establishment of the Kete Krachi Timber Factory will thus reduce accidents on the Volta Lake, and will also guarantee the safety of entrepreneurs whose activities require that they travel on the Volta Lake on regular basis. Addressing the gathering at Asuogyaman on Thursday, 22nd November 2018, on day 1 of his 3-day tour of the Eastern Region, President Akufo-Addo noted that the operation of the Kete Krachi Timber Recovery Limited is yet another manifestation of the 1-District-1-Factory initiative bearing fruit. He told the gathering that, before the end of his first term of office all the promises made to the Ghanaian people in the run-up to the 2016 election will be fulfilled, including the full realization and implementation of the 1-District-1-Factory policy. President Akufo-Addo indicated that the Government has approved an Incentive Framework specially designed for the 1D1F approved companies. The incentives, which include tax holidays, duty waivers and interest rate subsidies, are designed to help build the capacities and competitiveness of these enterprises, and to position them for greater productivity and efficiency. In promoting the 1D1F initiative, Government is seeking to address the challenge of severe poverty and underdevelopment among rural and peri-urban communities, by attracting private sector investments into the development activities of these communities. Additionally, the implementation of the programme has also received significant support from both local and international financial institutions, including the disbursement of some GH¢500 million to 1D1F projects from local banks. In addition to this, the Ministry of Trade and Industry is facilitating the engagement and negotiations between Business Promoters and some international financial institutions.